NutriGold contains isoflavones and horsetail extract in combination with highest quality, bioavailable forms of vitamins and minerals. Magnesium citrate – Magnesium reduces the occurrence of hot sweats, night sweats and other menopausal symptoms. It is also essential for absorption of calcium and maintenance of proper bone density. Horsetail Extract (equivalent to 400mg herb) – Helps absorb calcium and counter bone loss and osteoporosis. Also relieves urogenital ailments. Vitamin E (natural succinate) – Prevents hot flashes and night sweats. Also keeps cardiovascular system healthy. Soy Isoflavones – Isoflavones are plant hormones that can act as a replacement for estrogen in the body. They reduce menopausal symptoms like hot flashes, night sweats, mood swings, anxiety, etc. Vitamin C – Reduces vaginal dryness during menopause. It is also important for healthy bones and skin and delays onset of ageing. Zinc citrate – Prevents osteoporosis, muscle cramps, and depression. Copper (gluconate) – Prevents bone loss. Boron (sodium tetraborate) – Boron may increase estrogen levels and reduce menopausal symptoms like vaginal dryness and itching, hot flashes, night sweats, loss of bone density, etc. Manganese citrate – Helps maintain bone density. Chromium picolinate – Prevents weight gain and keeps bones healthy. Vitamin K* (phylloquinone) – Decreases bone loss and prevents weight gain. Folic acid – Reduces occurrence of hot flashes and prevents hair fall. Daily dosage should be between 1-3 capsules after meals. This product contains soy and may cause allergies in some people. Each bottle contains 90 capsules and is priced at £26.75, or around $42.8. The website is currently running a buy 4, get 1 free offer, which lowers the effective monthly cost to $34.24. The company offers a 60-day money back guarantee and returns 100% of the product cost less shipping and handling charges. Is NutriGold Menopause Support Formula Worth Buying? 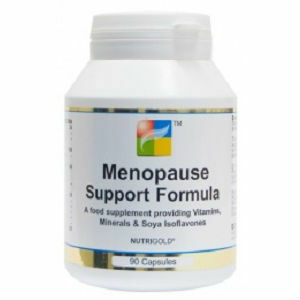 This supplement contains only two ingredients that help regulate hormone levels and all the remaining ingredients are vitamins or minerals, which the body required to cope with the deficiencies menopause causes. For these ingredients, the price of $34.24 per month is quite steep. Jackie Horowitz	reviewed NutriGold	on August 4th	 and gave it a rating of 2.